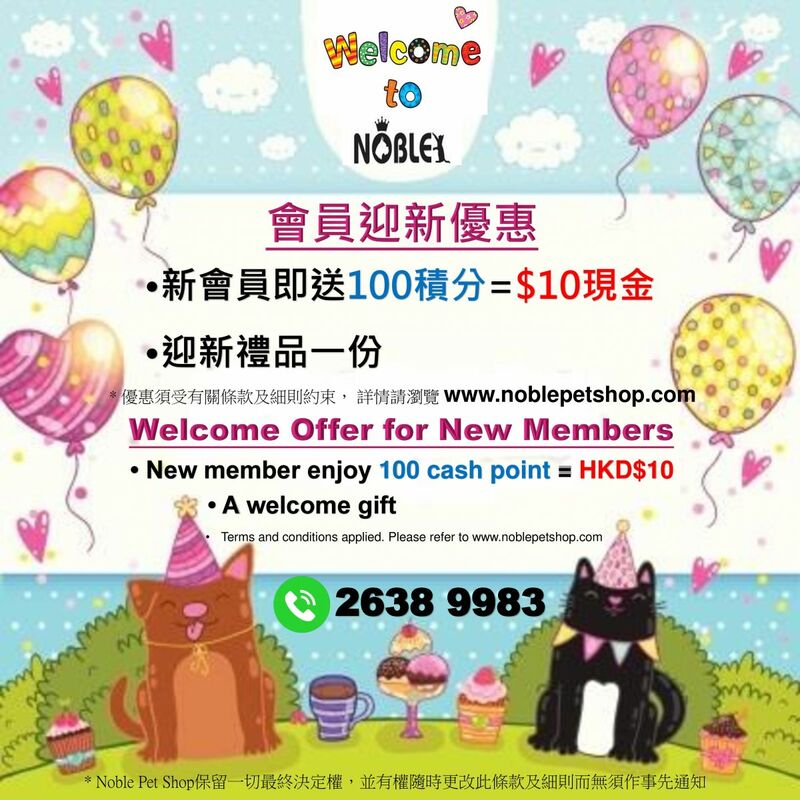 Welcome to Noble Pet Shop E-Store. Join Our free membership, can get 20% discount off. Wellness Natural Sliced Recipes for Cats"Heaithy Indulgence"
~ This welcome offer is only applicable to new members of the online registration; each new member can only enjoy this promotion once. ~ This welcome offer starts at 15/5/2016, 14/5/2016 at or before the registration does not apply to this promotion. ~ Welcome gift random issued, members cannot pick any style. ~Welcome gift will sent out after member first purchase. ~ When online purchase, member can deduce cash points for settlement, cash points will be subject to the Member's account. ~To use the cash points, members need to purchase $400 or over in each single transaction . ~ If this welcome offer has any inquiries, please call 26389983 and contact our staff. ~ Noble Pet Shop reserves the right of final decision, and reserves the right to change the terms and conditions without prior notice. 2) Purchase over $300.00 is free home delivery in Kowloon & N.T ,And in HK Island. Cash on delivery, Please prepare the totaly amount. Becasue our staff maybe not have enough money for the change. If pay by cheque, please pay to header "Noble Pet shop"
If nobody at home for waiting. The customer can choice bank in or paypal for the payment. And advice us to leave outside the door, keep in management or any on behalf of the consignee. But Noble Pet Shop will not responsible for any loss about it. **Notes: Accoding the actual stock of the goods, may be have a difference with the web site, so affect the delivery possibility, thank you!